Thoroughly enjoyed this course. Appreciate the time and energy put into giving an overview of the 3d concepts. An important next step for any serious coach that wants to do more than teach basics. If coaching is a calling and you want be a positive stake holder in young people's lives through sports...this is where you need to be. I found this course to be very informative, inspiring, and beneficial. 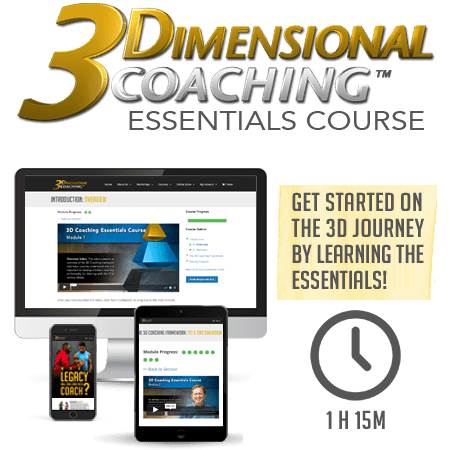 This is a fantastic course on coaching! I am excited to get the season going with all of these new ideas and ways to look at coaching. "Never be a players last coach". I thought this was a great course! Very informative and fun to take. It was great. Something that every coach needs to do. The information shared is extremely important and should be used by any and all coaches from the very first time they come in contact with athletes. I feel like this course is eye opening. At one point I got emotional. We all want to win and succeed but breaking down the brain/emotional parts of our athletes truly can open up and unlock all their potential to make everything click. The material was really well put together. Having recently completed a degree in Positive Coaching, it is nice to know that there are other sources of education and inspiration as I continue the process of becoming a transformational coach/educator/parent. Thank for the thought-provoking and inspirational instruction. This course has definitely made me a better coach. I love the great applications that I can take and immediately put in with my own team. This is a must for all coaches at all levels! Eye opening! Though I was such a good coach but was missing the boat!! It was great,easy to comprehend. Very helpful and wonderful strategies to put in practice with athletes and parents!